I’m always on the lookout for foods which do more than stop me feeling hungry. Super foods have benefits such as extra fiber, vitamins, minerals, etc. Quinoa is a high protein alternative to cous cous, for example, whilst buckwheat is a great alternative to regular flour. Recently, I came across a blog post, running a competition to win some super foods, such as chia, maca powder and lucuma. I was lucky enough to win, yet I had a lot to learn, as I had never come across any of these products before. Chia seeds are potent little bundles of energy with generous doses of omega-3, fiber and protein. Chia seeds are also a good source of several vitamins and minerals, containing vitamin A, B3, iron and magnesium. If you have a bit more time, @happylittlevego extended the recipe and guest-posted on my blog with a ‘Breakfast Pot’ recipe – a mix of chia pudding and bircher muesli. For the Bircher muesli, mix all ingredients together and add a little water or nut milk to meet the consistency you like, it shouldn’t be too dry; better to have a little more liquid as the oats will absorb it. Cover and place in the fridge overnight. The chia pudding should also be made the night before, mix all ingredients together in a bowl, stir every 5-10 mins for half hour or so, cover, then leave in fridge. In the morning layer the muesli, chia pud, yoghurt, mint and fruit (I like berries and rhubarb) into little jars to make breakfast pots! Super cute and ideal to grab when in a hurry! You can also make these on the weekend for your week ahead! If you are looking to improve your diet, these two breakfast options are a great place to start. 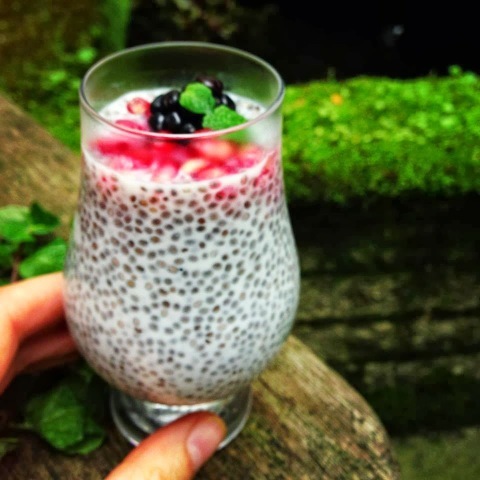 You can experiment with the chia seeds too by adding to porridge, smoothies or just get creative!